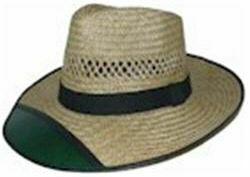 Natural straw hat with green celluloid visor. Ideal hat for full sun protection while gardening or working outdoors the visor allows you to have that sun protection while being able to see out. Shades your face and head area. Features a fabric bound trim and hat band. One size fits all. The sun tends to irritate my very light skin, I like this hat as it helps to keep the sun off of my face (which is more sensitive) while allowing me to be able to see what is going on around me while I'm working on my garden.